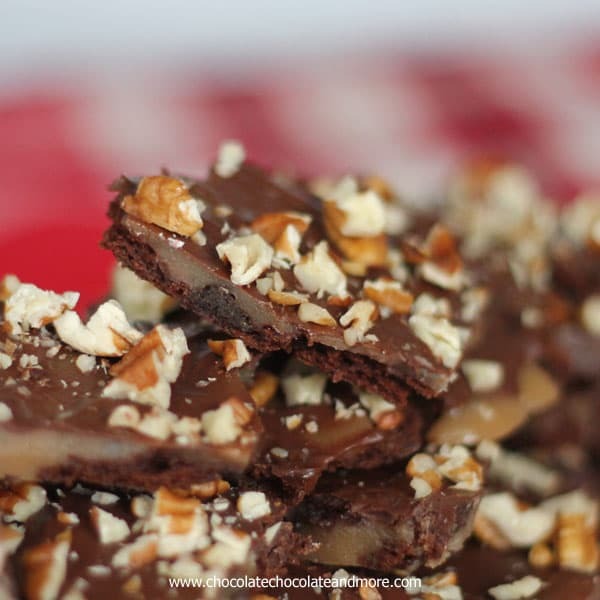 Brownie Brittle Toffee - Chocolate Chocolate and More! 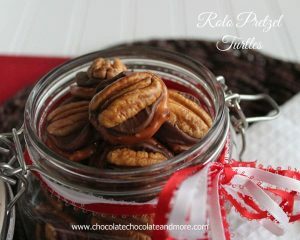 Brownie Brittle Toffee-crisp chocolate Brownie Brittle combined with buttery toffee and sprinkled with pecans! Makes a great gift if you can part with it! Brownie Brittle, have you ever had it? 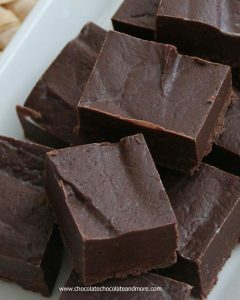 It’s more of a cracker in texture but tastes just like a rich fudgy brownie. It’s addictive. I’d never had it before, then Brownie Brittle sent me some to try. They sent all sorts of flavors (I didn’t even know there was more than just the original.) The Mint Chocolate Chip-I may have hidden that one from the kids, it’s so amazing! The only real problem I have with Brownie Brittle, it’s hard to stop eating. With 3 teens in the house, I knew if I didn’t do something, my Brownie Brittle would disappear faster than the chips that I keep well stocked. We went through 2 bags of it the first day. And really it was the first hour, I just don’t want you to know what pigs we are. 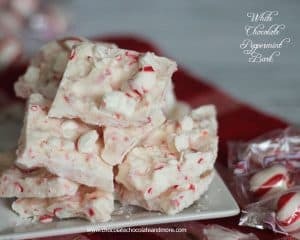 Adding it to a candy recipe was the easiest choice. I thought about fudge. I could either make it a crust on the bottom of fudge or I could break it into pieces and stir it into the fudge ( a great replacement for nuts!) I could crush it into crumbs and use it as a coating for truffles. I wanted the Brownie Brittle to stand out. To make sure it was noticed for what it is, a deep rich chocolate cracker with a delightful cookie crunch. It was the perfect pairing for my toffee recipe. 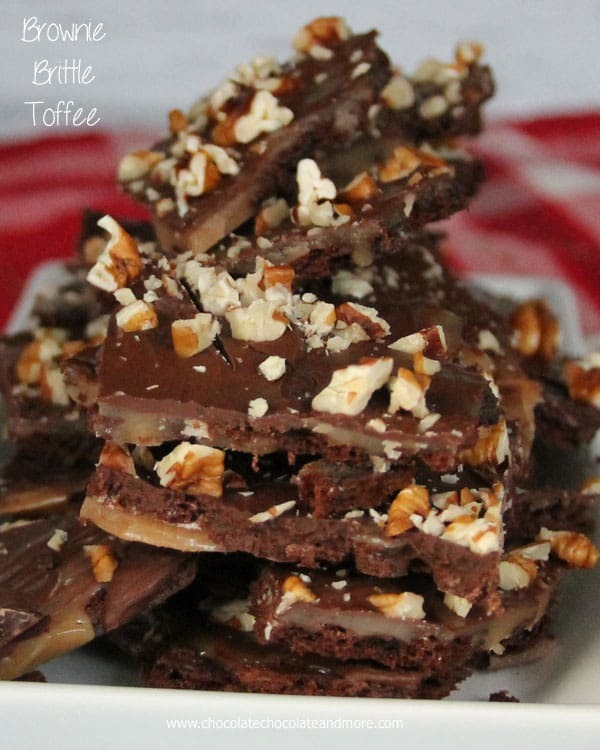 Toffee is such a hard candy, having the Brownie Brittle as a base, evened the hardness out, if that makes sense. Made a crisp, breakable treat. I’ll have to make another batch to share with friends, the kids ate all of this one! Line a 9 x13 pan with foil. Lightly spray with cooking spray. Place Brownie Brittle in a single layer on bottom of pan, start with the large pieces and then fill in the gaps with the smaller pieces and crumbs. Set aside. Remove from heat and carefully pour evenly over Brownie Brittle. Let sit for 5 minutes then sprinkle chocolate chips over top of toffee layer. Let sit another 5-6 minutes, until chocolate chips start to melt. Spread melted chocolate evenly over top of toffee. Sprinkle with chopped pecans. Let candy completely cool. Lift candy out of pan using foil. Remove foil and place candy on a cutting board to cut. Using a sharp knife, cut candy into squares. Store in an airtight container. 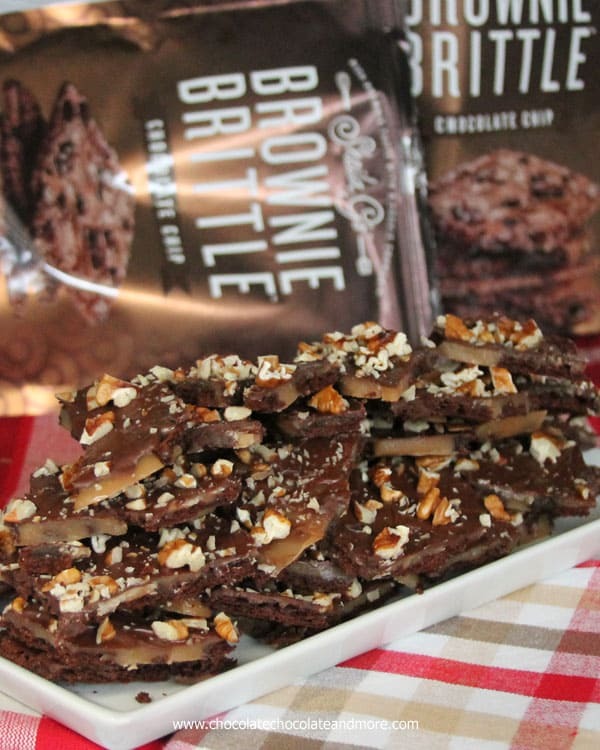 You can find Brownie Brittle on Facebook, Instagram and Twitter where they are always sharing great recipe ideas! Want more easy treats to share? This post was sponsored by Brownie Brittle, as always, all opinions are my own. 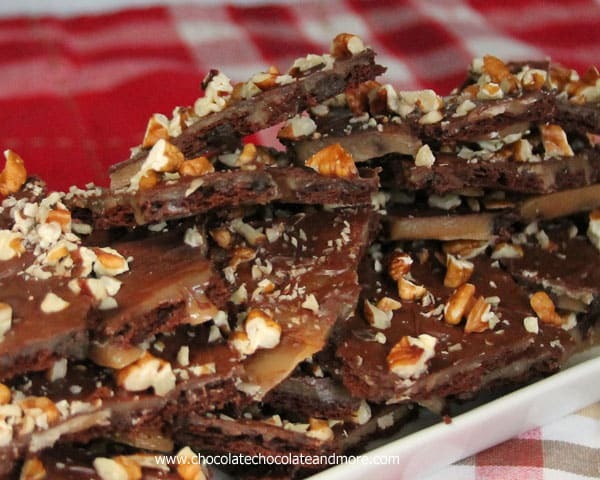 Definitely the best brownie brittle recipe out there! 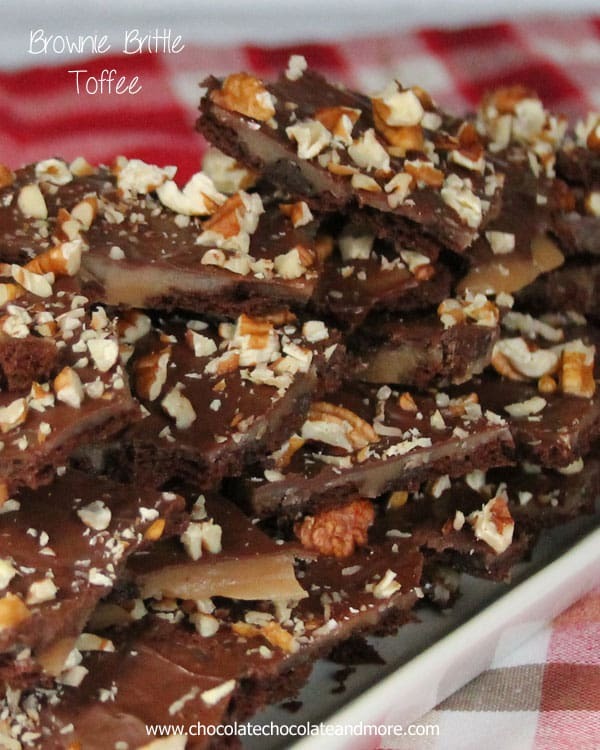 The stuff is totally addictive by itself, but I love the idea of pouring toffee, chocolate, and nuts all over it. Brilliant idea! I love this toffee Joan!! I too am OBSESSED with Brownie Brittle! Lucky for me, my boyfriend doesn’t like mint chocolate, so I have it all to myself! I have the same problem with Brownie Brittle! Cant’t stop eating it! The toffee sounds amazing! 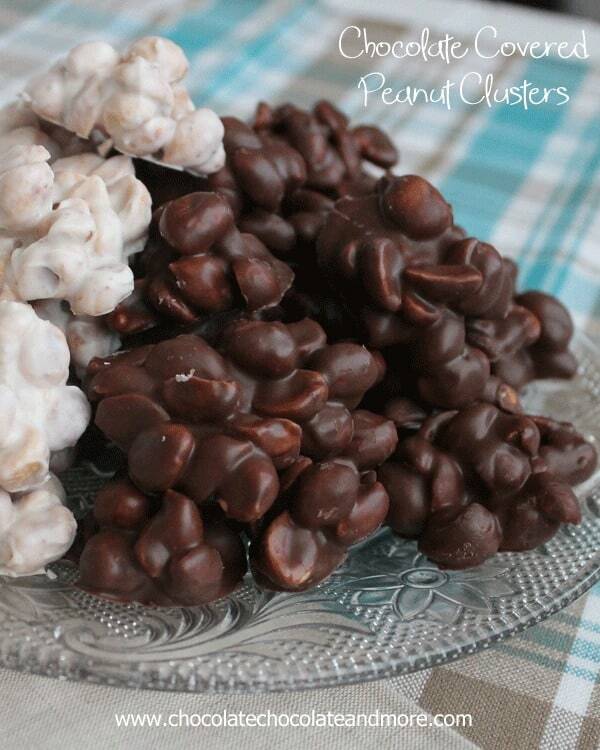 I love that you used brittle to make the candy easier to break and enjoy. Such a great holiday gift! This looks incredibly addicting and the perfect gift for the holidays! 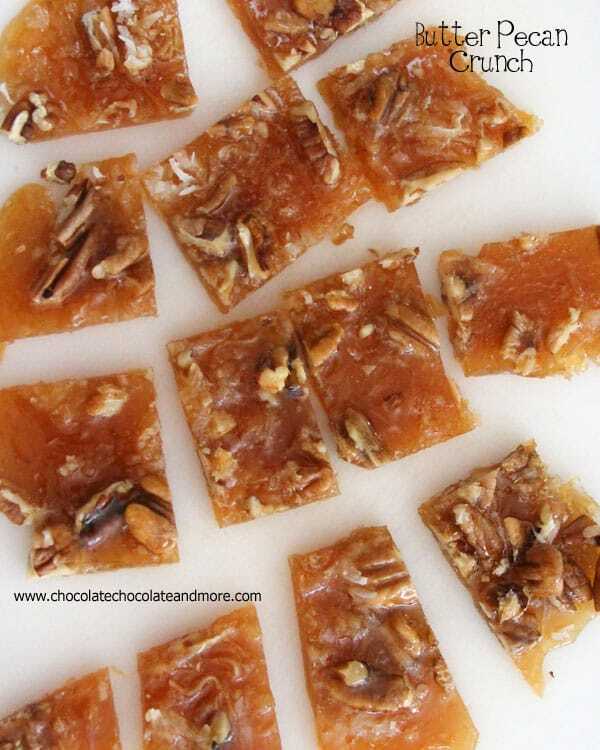 This toffee looks amazing, Joan!